ਹਚਰਸਨ ਹੁਣ ਲਾਸ ਏਂਜਲਸ, ਕੈਲੀਫੋਰਨੀਆ ਵਿਚ ਰਹਿੰਦਾ ਹੈ। ਮਈ 2012 ਵਿਚ, ਉਸ ਨੇ 1,861 ਵਰਗ ਫੁੱਟ (172.9) ਖਰੀਦੇ ਐਮ 2) ਹਾਲੀਵੁੱਡ ਹਾਲੀਸ ਵਿਚ ਲੌਰੇਲ ਕੈਨਨ ਵਿਚ ਹੀਥ ਲੇਜ਼ਰ ਦੇ $ 2.5 ਮਿਲੀਅਨ ਪੁਰਾਣੇ ਮਕਾਨ, ਇਕ ਛੋਟਾ ਜਿਹਾ ਖੇਤ ਹੈ ਜੋ 1951 ਵਿਚ ਬਣਾਇਆ ਗਿਆ ਸੀ। ਉਹ ਮੰਨਦਾ ਹੈ ਕਿ ਉਸ ਦੀ ਮਸ਼ਹੂਰੀ ਨੇ ਉਸ ਨੂੰ ਇਕ ਵਿਅਕਤੀ ਦੇ ਤੌਰ ਤੇ ਨਹੀਂ ਬਦਲਿਆ ਅਤੇ ਕਿਹਾ, "ਮੈਂ ਦੁਨੀਆਂ ਵਿਚ ਕਿਸੇ ਵੀ ਚੀਜ਼ ਨਾਲੋਂ ਜ਼ਿਆਦਾ ਆਪਣੀ ਨੌਕਰੀ ਨੂੰ ਪਿਆਰ ਕਰਦਾ ਹਾਂ ਅਤੇ ਮੈਂ ਹੋਰ ਕੁਝ ਕਰਨ ਦੀ ਕਦੇ ਕਲਪਨਾ ਨਹੀਂ ਕਰ ਸਕਦਾ। ਇਸ ਲਈ ਇਹ ਸਾਰਾ ਕੰਮ ਕਿਸੇ ਅਜਿਹੇ ਵਿਅਕਤੀ ਦੀ ਤੁਲਨਾ ਵਿੱਚ ਬਹੁਤ ਘੱਟ ਕੀਮਤ ਹੈ ਜੋ ਕਿਸੇ ਦਫਤਰ ਵਿੱਚ ਕੰਮ ਕਰਨ ਲਈ ਜਾਣਾ ਪੈਂਦਾ ਹੈ।"
Outstanding Young Ensemble in a New Medium The Polar Express "30th Annual Awards". Young Artist Association. Archived from the original on July 19, 2011. Retrieved January 6, 2014. Best Performance in a Feature Film – Leading Young Actor RV "2010 WAFCA Awards – The Washington DC Area Film Critics Association (WAFCA)". Washington D.C. Area Film Critics Association. December 6, 2010. Retrieved January 9, 2014. Best Cast Ensemble The Kids Are All Right "2012 NewNowNext Award Winners". Logo. Retrieved December 20, 2014. 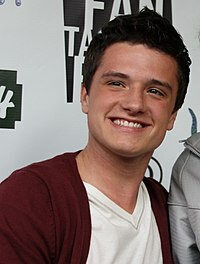 Best Ensemble The Kids Are All Right "Josh Hutcherson to Receive "CinemaCon® Breakthrough Performer of the Year Award"". National Association of Theatre Owners. March 27, 2012. Retrieved October 20, 2014. Next Mega Star The Hunger Games "Teen Choice Awards 2012: List of winners". CBS News. July 23, 2012. Retrieved January 9, 2014. Best Cast The Hunger Games Rome, Emily (August 20, 2012). "Ben Affleck, Lea Michele, Will.i.am, other celebs honored at Do Something Awards". Entertainment Weekly. Retrieved December 3, 2013. Best Kiss The Hunger Games "'The Hunger Games' wins big at People's Choice Awards". Entertainment Weekly. January 10, 2013. Retrieved December 3, 2013. Best Male Performance The Hunger Games Nordyke, Kimberly (August 10, 2014). "Teen Choice Awards: The Complete Winners List". The Hollywood Reporter. Retrieved November 13, 2014. Choice Movie: Liplock The Hunger Games Longeretta, Emily (June 9, 2015). "Teen Choice Awards Pit One Direction Against Zayn Malik". Hollywood Life. Retrieved June 14, 2015. 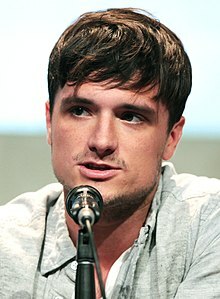 Choice Movie Actor: Sci-Fi/Fantasy The Hunger Games Halperin, James L. (May 1, 2004). Heritage Signature Auction #811. Ivy Press, Heritage Capital Corporation. ISBN 978-1-932899-12-2. ↑ Kiesewetter, John (October 19, 2003). "11-year-old finds sudden stardom". The Cincinnati Enquirer. Retrieved April 11, 2011. ↑ "Fun Facts About Josh Hutcherson". The Ellen DeGeneres Show. February 8, 2012. Archived from the original on December 11, 2013. Retrieved December 4, 2013. ↑ "Josh Hutcherson's new 'journey' to stardom". Qatar Tribune. February 2, 2012. Retrieved December 29, 2014. (subscription required (help)). ↑ "Josh Hutcherson Interview". KidzWorld. Retrieved December 1, 2014. ↑ Aftab, Kaleem (November 14, 2014). 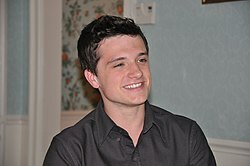 "The Hunger Games' Josh Hutcherson interview: Coping with the pressure with being the star of a Hollywood franchise". The Independent. Retrieved December 16, 2014. ↑ Buchanan, Kyle (August 3, 2009). "The Verge: Josh Hutcherson". Movieline. Retrieved December 19, 2014. ↑ Westhoff, Jeffrey (February 15, 2007). "Westhoff: 'Terabithia' stars hope to inspire imaginations". Northwest Herald. Archived from the original on January 7, 2014. Retrieved January 6, 2014. ↑ David, Mark (May 21, 2012). "Josh Hutcherson Buys Tree House in Tinseltown". Variety. Retrieved December 19, 2014. ↑ "25th Annual Awards". Young Artist Association. Archived from the original on August 17, 2016. Retrieved November 27, 2013. ↑ "26th Annual Awards". Young Artist Association. Archived from the original on April 14, 2015. Retrieved November 28, 2013. ↑ "29th Annual Awards". Young Artist Association. Archived from the original on July 6, 2008. Retrieved November 27, 2013. ↑ "30th Annual Awards". Young Artist Association. Archived from the original on July 19, 2011. Retrieved January 6, 2014. ↑ "16th Annual Critics' Choice Movie Awards (2011)". Broadcast Film Critics Association. November 20, 2011. Archived from the original on January 17, 2014. Retrieved January 9, 2014. 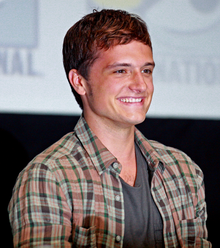 ↑ "Josh Hutcherson to Receive "CinemaCon® Breakthrough Performer of the Year Award"". National Association of Theatre Owners. March 27, 2012. Retrieved October 20, 2014. ↑ "Teen Choice Awards 2012: List of winners". CBS News. July 23, 2012. Retrieved January 9, 2014.